Kawaii Flashing Phone Straps ♥ Cute-Stuffs.com! ♥ Kawaii Shop - Phone Straps, Charms, Dust Plugs & More! Don't forget, you can convert any of our charms to necklaces or use as backpack, purse, zipper pull charms, and more, just use your imagination! These charms flash when sending or receiving a call or text. Please note, most of these flashers only work on a frequency of 900-1800MHZ, which is most standard phones. However, we've gotten more and more feedback as of 2012 that these work on other frequencies as well, but we do not guarantee it. They still make adorable charms either way! 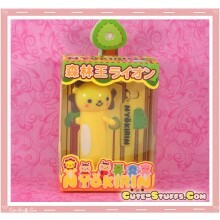 Kawaii Rare Nyokirin Led 2 Pc Phone Strap! Lion!